NAMU Guesthouse i Seoul, Sydkorea: Reservér nu! 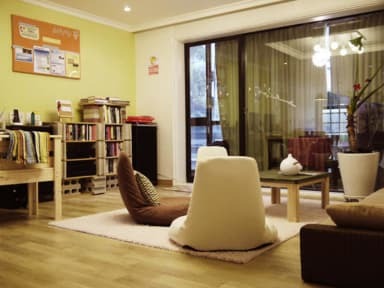 If you are looking for a cozy, friendly, family-style place to stay in Seoul, then NAMU Guesthouse is the place for you! Friendly managers provide personal service to help your travels. Free home style breakfast with tea, coffee, juice, fresh bread, cereal, cheese and eggs. We have organic bread from the bakery everyday. Special home-cooked breakfast on Sundays. Our managers will help you book tickets for performances and local tours (including DMZ tour). Free laundry facilities and free wireless Internet. No alcohol or smoking is allowed in our guesthouse. Take the AREX subway line directly from the airport to Hongik University Station in just 46 minutes. Walk just 8 minutes from the subway station to our guesthouse. Due to the Korean Law, people who have Korea nationality are not allowed to stay.